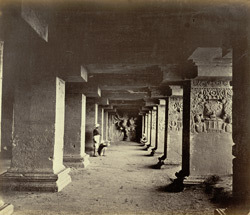 Photograph of the interior of the Dasavatara cave at Ellora and of the Narasimha bas-relief from the 'Lee-Warner Collection: 'Bombay Presidency. William Lee Warner C.S.' taken by J. Johnston in the 1870s. The site of Ellora is famous for its spectacular series of Hindu, Buddhist and Jain cave temples excavated into the rocky façade of a basalt cliff. The works were carried out under the patronage of the Kalachuri, the Chalukya and the Rashtrakuta dynasties between the sixth and the ninth centuries. The Dasavatara cave was initially a Buddhist monastery, but in the eighth century it was converted into a Hindu sanctuary under the patronage of the Rashtrakuta king Dantidurga who is thought to have ruled between 730 and 755. The original Buddhist monastery consisted of a two-storeyed hall. The walls of this structure are covered with carved reliefs illustrating Hindu mythology. The hall opens onto a courtyard which contains a free-standing monolithic mandapa in its centre. This view shows the interior of the hall. The columns have elaborate pot and foliage motifs carved on their shafts. In the background, the carved relief depicts Vishnu as Narasimha (his man-lion incarnation) destroying the demon Hiranyakashipu.